Genome Prairie Impacts Report: The local, regional, national and international Impacts. 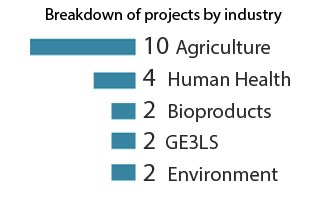 Genomics and related biosciences are advancing at an unprecedented pace. Each day, researchers are making new discoveries that promise to change our understanding of the world and enable the development of innovative products and services. These discoveries are at the heart of the knowledge-based economy and are increasingly recognized as a key source of competitive advantage for companies, industries and regions. 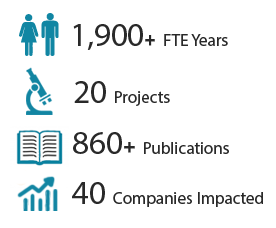 With our partners, we have supported more than $260 million of research activity in plant, animal and human genomics, bioinformatics, instrumentation development and bioethics since 2000. Genomics will change what we know today and how we will live tomorrow. To accelerate and leverage knowledge translation of genomics discoveries to social and economic benefits for the people of Manitoba and Saskatchewan. To date, Genome Prairie has supported over $260 million of research activity. These funds come from a range of different federal, provincial, industry and international sources, including $111 million from Genome Canada. This value also encompasses the in-kind research provided by project partners across Canada and around the world. Of the $260 million in research activity supported, over $85 million has been invested directly into Manitoba and Saskatchewan. Prairie provinces have invested $27 million into Genome Prairie projects generating significant leverage with an average of 3 times the return on investment. Find out about current project development and funding opportunities. With these investments in advanced bioscience research, we’ve developed and managed 20 projects. These projects have had impacts in a range of different industries and areas of interest affecting Manitoba and Saskatchewan. View our projects page to find out more. These projects have also provided valuable training opportunities and knowledge based jobs for the region. Our projects have also resulted in a number of new discoveries that are resulting in innovations such as hardier crops, better vaccines, new biofuels and many more. By aligning our projects with the latest technology and research, we are keeping Manitoba and Saskatchewan on the map in a globally competitive research environment. Our projects have resulted in a number of collaborative relationships with partners around the world. This map indicates the locations of project partners, research activities, presentations and conferences. The international partnerships that we have established help Manitoba and Saskatchewan stay at the forefront of genomics and related biosciences.